"Look at all the flowers!" Bonnie squealed in delight. I see roses, foxgloves, thistle, poppies and, oh look, there are some orchids. "My tummy is rumbling for some sweet nectar. The big problem is which do we sip first? The roses? I say we fly down and see how delicious those roses are." "Bonnie, you are always thinking of your tummy. I do admit though, the roses are pretty. I wonder where we are?" Bruce asked. As they fluttered down to the flowers, Bruce noticed a sign atop an old building. "Oh. I see. We’re just outside of Penicuik." "It doesn’t matter where we are, Bruce. As long as there is food!" Bonnie smiled. She landed on a large yellow rose. "Its petals are soft, like velvet, and just take a sniff. Isn’t that marvelous?" She stuck her proboscis into the center of the rose and began to sip the nectar. Bruce landed on a nearby bush. It was covered with bright pink roses. He sniffed them and then sipped from one. "When we’re done, let’s go into town. Penicuik seems to be a nice place," Bruce suggested. "After we’ve attacked those foxgloves over there, then we can think of going into Penicuik," Bonnie said. As they headed for the foxgloves a while later, Bruce was the first to notice all the huge bumblebees flying around the flowers. "Look at all the bees! They’re gigantic!" he said. "Bees won’t hurt us. If you’re afraid, you go on over to the thistle. I’ll come over when I am finished," Bonnie said. She flew towards the foxgloves. One bee buzzed at her as she landed next to him on the pink foxglove, but she didn’t pay any attention to him and soon he flew away. Bruce, not wanting to mess with the bees, chose the fuzzy purple thistle. "What is that noise?" Bruce asked, when Bonnie landed next to him on the thistle. "It sounds like a cat having its tail pulled." "It is rather loud and screeching. Why don’t we go and see," Bonnie said. Agreeing, the two butterflies flew towards Penicuik. They soon reached the center of the town. "Why are all those people gathered there?" Bruce asked. "It looks like some kind of festivities. It might be fun. Come on, Bruce." They flew down towards the crowd and landed on the top of a bagpipe. The pipe band was taking a break. "They’re all wearing kilts and look the same. I like that tartan," Bonnie said. "They do look rather dashing in their band uniforms. Do you think they’ll march down the street? I wonder if this was the noise we heard earlier? You know, the one that sounded like an angry cat? It was probably the bagpipers warming up," Bruce said. "Hee, hee, hee." Just then the pipers stood up. They organized themselves into rows. Bonnie and Bruce stayed on top of the bagpipe to watch. "It’s very colorful, don’t you think?" Bonnie asked. The band began to play. "Oh my!" Bruce said, putting his hands over his ears. "What a loud noise. Let’s go over to the bakery and sit on the roof," he suggested. Bonnie couldn’t stand the noise either. They flew to the bakery. "This is much better. I am nearly deaf from that bagpipe!" "They do sound rather nice though, don’t they? I like that tune," Bruce said, tapping his foot and clapping his hands. They watched the band walk down the street. It turned around and came back. "This is grand! We’ve got the best seats in town." They listened to all the songs the pipe band played and enjoyed their afternoon in Penicuik. The baker had been baking delicious breads, donuts, cakes and biscuits all morning and was selling them to the visitors who came to see and listen to the band. "Those biscuits smell good. Maybe we could have a wee taste of one, do you think?" 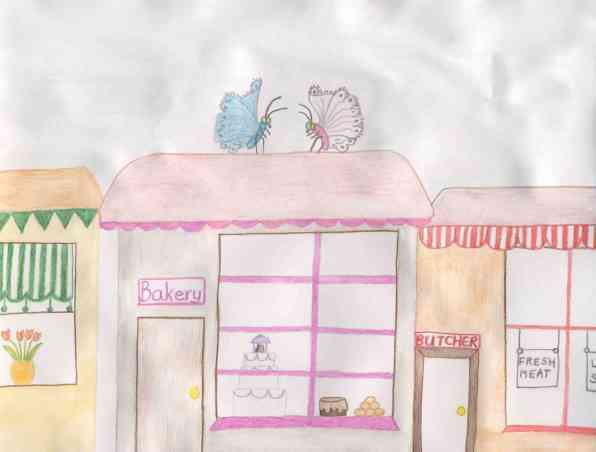 Bonnie smiled and flew into the bakery. She landed on a sugary glazed donut and had a taste of it. "Delicious!" Bruce, who had followed, was fluttering about the cakes. He headed for a chocolate cake, covered with thick, gooey, chocolaty frosting. "This is delicious!" he mumbled, his mouth filled with the sweetness. SHOO! SHOO! SHOO! The baker didn’t want butterflies in his bakery, landing on his donuts and cakes! He swatted at Bruce and Bonnie. "Yikes!" Bruce cried. "We’d better get out of here fast!" They flew out of the door and back up to the roof. Bruce licked his arms and legs, which were covered with chocolate. Bonnie licked the glaze off herself too. "I think we’re safer back at the thistle and roses," Bonnie said. "It was nice listening to the pipe band and tasting the baked goods, but I think its time to go now. The sun will be setting soon." The butterflies flew back to the hills, found two fluffy thistles, and curled up on top of them. That night Bonnie dreamed of donuts and Bruce dreamed of chocolate cakes and their grand day in Penicuik!